Like I said before..I could feel the waves of 'Alles in Ordnung' coming my way. So here it is, and I hope its here to stay. You know you are a true crafter when you spy DIY everywhere! I simply covered the box using a fabric I have used in so many other projects too. I wanted a storage box for my 1 year old's books. 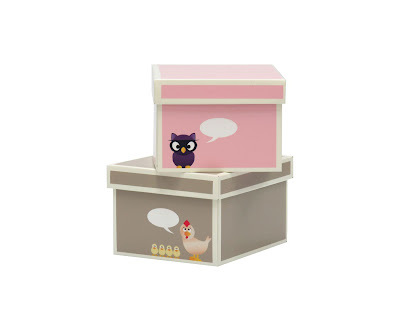 After seeing the set of two boxes above..my brain went hmmm > owl > wise > books > pillow > diaper box! For the label..my printer was out of ink and I don't have the luxury of a fancy silhouette machine so I just cut out a petal of a flower from a printed contact paper. GENIUS!!!! Gosh I wish I would have seen this before potty training Emanuelle! I had so many of these boxes!